Inflammation is our body’s natural response to injury. Tissues get inflamed because extra blood carrying nutrients and oxygen rush to the surface to speed up healing. The issue with inflammation happens when it stays too long or triggers a more complex immune response when it’s simply not needed. 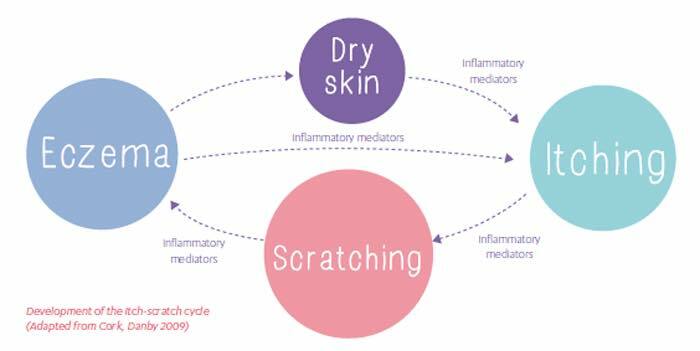 In the case of eczema, inflammation near the skin can be all it takes for an eczema flare up to happen. Inflammation is a hot, itchy, and often sore issue. Since blood flows to the area in greater amounts, more heat is delivered. The heat generated by inflammation helps open up blood vessels and capillaries while also expanding and opening up tissues. Sports injuries, sprains, and strains can also be caused by inflammation in a joint or muscle. If you’ve ever dealt with these issues you know that one of the most suggested remedies is ice! Cooling an inflamed area causes blood vessels to constrict which forces inflammation, toxins, and immune chemicals out of the area. This can lead to nearly instant relief – and it can be applied to eczema, too! So, prepare your Cold Cream by putting Remdii Sensitive in the fridge. The cold Remdii Sensitive helps flush toxins from the skin, relieve inflammation, soothe itching, and relieve pain. It’s a nearly instant relief for many kids, and the cool feeling is a welcome relief from the heat and itch of inflamed skin tissues. For more serious itch, ice the area with a cold pack before applying the cold Remdii Sensitive. I hope this tip will help prevent the eczema from worsening!